Kurevsky brutální death poháněnej chytlavejma riffama, fakt rychlejma bicíma a občas až absurdně hrubým řevem. O tom všem je PUTRID PILE. One-man projekt bude jedním z největších překvapení OEF 2016, ze kterýho vám zalezou špunty do uší hluboko do mozku. PUTRID PILE ti nakope zadek!!! In late 1995, Shaun LaCanne joined the band Numskull and had a 5 year reign of terror with the likes of Tom Bradner (Guitar), Paul Benigno (Vocals), Mike Eisenhauer (Bass), and Scott Creekmore (Drums). We went through a couple of lineup changes introducing Mark Page (Bass), and later Ryan Schaefer (Bass). Due to some circumstances beyond anyone’s control, Numskull disbanded. Hence the birth of Putrid Pile. Frustrated with Numskull's breakup, I, (Shaun) had to press on and be a part of the sickness that is the underground! Knowing already what I wanted, I immediately picked up a drum machine and started writing intense, sick and twisted guttural death metal. By the end of 2000, Putrid Pile had enough material for a 5-song demo. Early in 2001, Putrid Pile went to Mercenary Digital Studios to record the demo and entitled it "Bleed For Me". The first time it was ever released into public hands was at Milwaukee Metal Fest 2001. It received a great response from the people who received a copy. Shortly afterwards Putrid Pile concentrated on live shows and getting as much publicity as possible. Putrid Pile continued to play gigs mercilessly and whore out free "Bleed For Me" demo to anyone who would take one in the US and around the world. The demo received many awesome reviews and continued to get a great response in the underground from bands, zines, webzines, radio stations and fans. The shockwaves of the release of the “Bleed For Me” demo are still being felt to this day! Eventually, Putrid Pile caught the ear of United Guttural Records and signed a one record deal with them. After the signing, Putrid Pile went into strict writing mode. Writing a total of seven more songs, along with the five songs from the demo, to record the first full length, “Collection Of Butchery” to be released in early 2003. "Collection Of Butchery", transformed into an amazing underground classic with awesome artwork and excellent /professional production and was well received by most. In 2005 Putrid Pile recorded their sophomore CD entitled "The Pleasure In Suffering" that was released on Gorgiastic Records. This twelve track release received rave reviews in magazines such as Metal Maniacs and the like. Also, many of the tracks have gotten massive airplay and requests on loads of college radio stations and webcasts across the nation and the world. With some of the classic cuts on the disc being, "Food for the Maggots", "My Inner Demon" and 'Rush-Hour Killing Spree' to blast your eardrums into oblivion. 2005 also provided the release of Putrid Pile's first split recording with another sick disgusting brutal death metal band from Wisconsin, Dyscrasia, released on Bizarre Leprous Productions. In May 2009 Putrid Pile released the Junior CD of the band entitled "House Of Dementia" on Sevared Records! With guitar solos and monster riffing, it crushes the senses and grinds your eardrums to a pulp! This album was one of the best releases of 2009 and a must have for fans of the extreme metal genre. This release also helped the band to get such great endorsement deals from the best companies in the business such as, Jackson Guitars, Spectraflex Original Braided Cables, and Vader Cabinets. In 2011 Putrid Pile announced the release of the Viral Load split CD on Relapse Records!! It did very well and in the scene and is still available for purchase at relapse.com. 15 mins. a piece from each band and its sure to quench your thirst for brutality! Also that same year secured the re-release of the Putrid Pile classic "The Pleasure In Suffering" released on Sevared Records and includes tons of live material recorded all over the world from various festivals and shows as well as the "Bleed For Me' demo in its entirety. With seven releases under Putrid Pile's belt it was time for the release of the bands senior full length release, "Blood Fetish" also released on Sevared Records 2012. This 30 minute masterpiece is by far the best and most mature release of Putrid Pile to date! It has many hits as most Putrid Pile releases do, but some of these titles include the title track "Blood Fetish", "Bowel Batter" and "Tortured Soul." There such different mixture on this disc with old school D-beat aggression to face-pounding grind to ultra slam there's a little something for everyone there. In the same year Sevared Records also released Putrid Pile's first live DVD "Live At Obscene Extreme 2011" which features the whole crushing set at OEF as well as the whole set from Obscene Extreme 2008 and the whole almost an hour set from the very first Deathfeast in Hunxe Germany 2007. Both available from Sevared.com or from the band directly. With all of these releases and countless shows all over the United States and the world, with places traveled and crushed such as, Japan, India, South America, Mexico, Canada, Indonesia, Thailand, Malaysia, Russia, all over Europe and the UK, and soon to be Australia, the demand for this one-man-army has been tremendous! 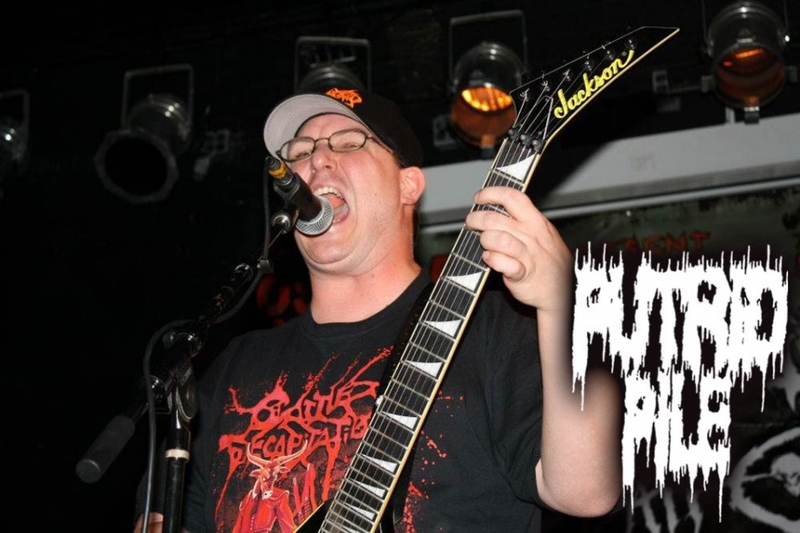 In the future, Putrid Pile plans to stay a one-man-band, and continue to progress and keep making quality, extreme Death Metal for the masses. Still keeping the original vision in mind, but not turning my back on the idea of change. The new material is a little more technical, then “Collection”, but still has the insane hooks of old and new school Death Metal that fans of the band have come to know and love. Be expecting to see awesome and intense live shows and many more full lengths to come. There's no stopping Putrid Pile in 2015 and beyond!